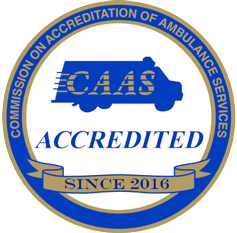 Gold Cross EMS is proud to be the first and only Ambulance Provider in the CSRA to obtain Accreditation through the Commission on Accreditation of Ambulance Services (CAAS). Out of over 260 Ambulance Providers in the state of Georgia, Gold Cross is only the 7th to become Accredited. The Commission on Accreditation of Ambulance Services was established to encourage and promote quality patient care in Americas medical transportation system. Based initially on the efforts of the American Ambulance Association, the independent Commission established a comprehensive series of standards for the ambulance service industry. Accreditation signifies that your service has met the gold standard determined by the ambulance industry to be essential in a modern emergency medical services provider. These standards often exceed those established by state or local regulation. The CAAS standards are designed to help increase operational efficiency and decrease risk and liability across the entire spectrum of the organization. located east of Covington and Macon.